Win a Free Massage or Facial! Underarm sweat and odor can be really embarrassing. Excessive sweating (known as hyperhidrosis) can affect men and women and, until recently, there was little that could be done to permanently stop it. Now there is miraDry – in Santa Barbara at Evolutions – that is an FDA-cleared treatment that eliminates sweat and odor glands in your underarm area. In one to two treatments, you can become dry and odor free permanently! The miraDry treatment is gaining popularity across the nation. It was recently featured in a news segment in Raleigh, North Carolina. Dr. Cynthia Diehl and her staff explain a bit more about miraDry and show a treatment being done. To watch the video, click here. Put a stop to your excessive sweating! Call us today at (805) 695-2189 to schedule a complimentary consultation for miraDry in Santa Barbara. Dysport is the first, real alternative to Botox Cosmetic and is now available at Evolutions Medical Spa! Santa Barbara cosmetic surgeon Dr. Terry Perkins, who is also the founding medical director of Evolutions, recently released an article reviewing Dysport versus Botox. Read Dr. Perkins’ press release on his Cosmetic Surgery Center blog! Clients who have tried Dysport are pleased. And nothing is more pleasing than receiving money back for using a product that yields results! When you come in for your Dysport treatment, ask about the rebate because through October 31st, 2009, clients receive a $75 rebate on a Dysport treatment! And there is more for Evolutions’ Wrinkle Free Club Members! Wrinkle Free Club members will also receive $1 in product credit for every 2 units of Dysport purchased. To set up a Dysport consultation, call Evolutions Medical Spa Santa Barbara at 805.687.0212 and ask about the Wrinkle Free Club too! Evolutions Medical Spa offers mild, medium and deep peels as single treatments and also as series. Two of the most common types of peels used are: Alphahydroxy acids (AHA’s) and Trichloroacetic acid (TCA). Alphahydroxy acids (AHAs), such as glycolic, lactic, or fruit acids are the mildest of the peel formulas and produce light peels. These types of peels can provide smoother, brighter-looking skin for people who can’t spare the time to recover from a TCA peel. With a mild AHA peel, you probably won’t peel at all, but, only get some temporary redness and/or dryness. And the process that you experience will not prevent you from working or engaging in your normal activities. Improvements from AHA peels may be very subtle at first. You may detect a healthier glow to your skin. With continued treatments, you will notice a general improvement in the texture of your skin. Trichloroacetic acid (TCA) can be used in many concentrations, but it is most commonly used for medium to deeper depth peeling. With a medium strength TCA peel, you could actually go out to dinner that night (with a little makeup). You might be a little red and tight, but, no one would know that you just had a peel solution applied. In about 1-2 days you will start the peeling process. The down-time after treatment is usually 3-4 days of peeling. At Evolutions Medical Spa, our Alpha-Beta Peel improves the look of fine lines, wrinkles, acne scarring, pigment problems and unclogs pores. If you want to dramatically improve your complexion in about 2 weeks, go for the Obagi Blue Peel (“Blue for a day!”). The blue solution allows the clinician to control the evenness of the peel; while the number of coats influences the depth of the peel. Immediately after the procedure, the bluish tint remains on your skin, which washes off in the first few hours. In about a week to ten days, your new skin will be apparent and you should be healed sufficiently to return to your normal activities. During this time, it is especially important that you use a sunblock or blotchy, irregular skin coloring may result. During a chemical peel, most patients experience a warm to hot sensation that may last about 5 to 10 minutes and may be followed by some stinging. At Evolutions we have a Synercool machine that blows cool air on your skin to ease the stinging. 3-4 layers may be applied and the solution is then neutralized. The whole process only takes about 45 minutes. The results are not permanent, as a chemical peel cannot stop the skin from continuing to age. Depending on the strength of the peel, periodic treatments may be necessary until the desired effects are achieved. Because sun exposure accelerates signs of aging, protecting the skin from sun exposure will lengthen the amount of time that the results are seen. Protecting the skin from the sun also can prevent some signs of aging. Ask your clinician to recommend a sunblock with adequate UVA and UVB protection and use it every day. One of our favorite sunblock products is TIZO3. It has an SPF of 40, is water resistant, and has a slight tint to it. The Tizo3 has a velvety, non-greasy feel and gives you a little coverage too. Also, Nia24 with 5% Pro-Niacin®, not only provides SPF30 UVA/UVB protection, but, also repairs past damage and promotes skin health. It is very important that you find a clinician who has adequate training and experience in chemical peels. Permanent skin lightening and lines of demarcation may occur, if not done by a well trained medical aesthetician. Cosmetic surgeon Dr. Terry Perkins, who is also the owner of the Cosmetic Surgery Center Santa Barbara, personally sets protocals, trains and supervises all procedures at Evolutions. During your initial complimentary Evolutions Consultation, it is important that you discuss your expectations with your clinician. Don’t hesitate to ask any questions or express any concerns that you may have. The clinician will explain the planned procedure in detail, including its risks and benefits, the recovery period and the costs. Chemical peels are amazing by themselves, but, they also compliment other services. At Evolutions Medical Spa, you may enhance the results of a chemical peel with laser/light-based rejuvenation techniques, or combine with another procedure, such as dermal fillers (i.e., Restylane®, Radiesse®) or botulinum (Botox® or Dysport™) rejuvenation. A thorough evaluation by your clinician will help determine what best meets your needs. At Evolutions we price chemical peels as individual treatments and as a series. We encourage you to come in for a complimentary skin rejuvenation consultation. Fill out our contact form online or call us for an appointment 805.687.0212 today! Evolutions Medical Spa is located in downtown Santa Barbara. Although summer is winding down, Brazilian laser hair removal is still hot at Evolutions Medical Spa in Santa Barbara! Why? With itsy-bitsy bikinis being so popular, it has become a priority for women of all ages to take care of their hair – or more appropriately, take care of removing their hair. Non-permanent hair removal methods like shaving, waxing, sugaring, threading or depilatory creams are less expensive, and work at removing hair, but the frequency for these methods adds up (once a day, once a month, etc.,) and your hair always grows back. The Comet is considered to be the new Gold Standard in laser hair removal systems. The PPx uses patented photopneumatic therapy and is a painless treatment. It does not even require numbing cream. The CoolGlide uses Nd:YAG technology and is ideal for darker skin types. The ProWave is a programmable IPL and is able to cover large areas with very little discomfort. Bonus! The Dual-Laze hair removal treatment combines the Comet and the PPX into each treatment using a proprietary protocol developed by cosmetic surgeon Dr. Terry Perkins, owner and overseer of Evolutions. Laser hair removal is done in a series of treatments, depending on the growth cycle of your hair and determined by the clinician at Evolutions. Every person is unique and will have a varying response to treatment. After completing the initial series it is often necessary to come in for a single maintenance treatment every six to nine months. For that reason, the FDA requires that laser hair removal treatments be referred to as “permanent hair reduction” rather than “permanent hair removal.” That said, most people are very happy with the permanent clearance they are able to achieve from an initial series. Evolutions does not just do Brazilian laser hair removal! Hair can be removed anywhere with the exception of immediately around the eyes and inside the nose and ears. Popular laser hair removal places are for the under arm, leg, and back, in addition to the bikini area. At Evolutions we price laser hair removal by “time”, as opposed to ‘area’, because hairlines can vary from one individual to another. We encourage you to come in for a complimentary laser hair removal consultation and at that time an accurate price for a (5) treatment series package will be quoted. Fill out our contact form online or call us for an appointment 805.687.0212 today! Yesterday Evolutions Medical Spa in Santa Barbara held an exciting educational event introducing Dysport – the first real alternative to Botox. On hand was the Dysport representative (left in the picture) who held an informative presentation and question and answer period followed by a live demonstration by Dr. Terry Perkins of a patient receiving Dysport. In addition, attendees who purchased a Dysport treatment at the event received a special discount and one lucky raffle winner won a free treatment! Read more about Dsyport and Botox on Evolutions website. A Dysport treatment session usually lasts 30 minutes. Call Evolutions to book your appointment today – 805.687.0212! Now available at Evolutions Medical Spa in Santa Barbara – DYSPORT!! An alternative to Botox®, Dysport is another effective treatment to smoothing lines between your brows and reducting wrinkles in your forehead and around the eyes. Dysport is a better value per unit than Botox – it works faster and is a smaller molecule so 20 units of Botox equals 50 units of Dysport. Both Dysport and Botox are forms of Botulinum Toxin Type A. Both products have been used in Europe for almost 20 years to treat certain types of muscle disorders. Botox received FDA approval for cosmetic use in the U.S. in 2002. Dysport recently received FDA approval. Both products are safe and effective in the treatment of wrinkles on the face (“frown lines”). Dysport works faster (1-3 days vs. 4-7 days for Botox) and has FDA approval for a four month duraction (vs. 3-4 months for Botox). 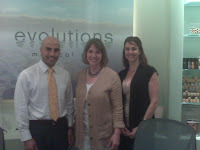 Evolutions Medical Spa in Santa Barbara is owned by cosmetic surgeon Dr. Terry Perkins. Dr. Perkins has more than 30 years of cosmetic surgery experience in Santa Barbara and Ventura counties and was one of only 16 doctors in the United States to conduct a study leading to the FDA approval of Botox for cosmetic use in 1999. Dr. Perkins is excited to introdue Dysport – a real alternative to Botox! Call 805.687.0212 to book your appointment today to try Dysport! Did you know that financing is available through CareCredit for any, or all, of your procedures at Evolutions Medical Spa in Santa Barbara? Once approved, you can use your CareCredit card for procedures at over 90,000 participating health care practices including Cosmetic Surgery Center in Santa Barbara. Learn more about CareCredit here. Summer is here in Santa Barbara and, yes!, there is a way to stop the embarrassing sweaty underarms or sweaty palms so you that you may enjoy the season in confidence! Some of you may be familiar with the term hyperhidrosis – a clinical term for a condition where a person produces an abnormal increase in perspiration to regulate the body. Many of us suffer from hyperhidrosis – not only in day-to-day activities, but in events in our lives that will live forever in our memories – weddings, big work presentations, reunions – not knowing that there is a solution out there that is much better than grocery store deodorant. 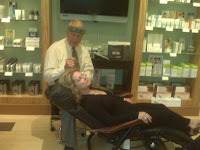 At Evolutions Medical Spa in Santa Barbara we are here to help! We can cut your sweating up to 90% for six to eight months using an FDA-approved treatment of BOTOX injections. Botox blocks the signals sent to the treated sweat glands telling them to sweat. Enjoy your summer with dry, odorless underarms (or palms or feet)! If you’d like to know more, contact Evolutions Medical Spa Santa Barbara via our online complimentary consultation form or call us for an appointment at 805-687-0212. We also use Botox for smoothing lines and reducing wrinkles! For more information on hyperhidrosis, visit the International Hyperhidrosis Society. Founded by Dr. Terry Perkins, Evolutions Medical Spa fuses a clinical setting with luxury that provides physician-level care and top notch technology in a beautiful, relaxing, welcoming, spa-like environment. Great service, very nice staff and the facility is amazing. Sammi is the best therapy masseuse I ever have had. Hands down, this is the best spa around! I have gotten two facials here, and each time my skin was... read more beautiful and glowing for weeks! The staff is very professional, the environment is tranquil and clean. The locker rooms have saunas and there is a tea lounge to use while you wait with multiple teas to choose from and snacks. The locker rooms are also luxurious. You get a locker, a robe, flip flops, and towels to use while there. Copyright 2019 Evolutions Medical & Day Spa, Inc. All Rights Reserved.